Well, for those who backed it at $20 or above. Hopes for a 3D platformer revival rest on the shoulders of the colourful Yooka-Laylee (with a few hopes reserved for A Hat in Time, and also Poi). The full thing isn't expected until early next year, but if you threw $20 at the Kickstarter you should receive an email today with a key for the Toybox: a sandbox demo offering a taste of the game's systems, in an environment separate from the main game. Meanwhile, backers who shelled out $35 or above will be given access to Toybox+, which also includes a new area, and combat. 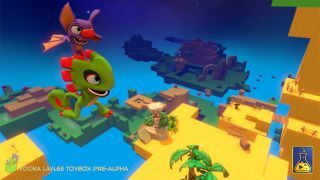 "As promised in our campaign, the Toybox isn’t a traditional ‘demo’," developer Playtonic Games explains on its website, "but a self-contained, spoiler-free sandbox designed to give Yooka-Laylee backers a taste of the platforming to come in the final game. There are moves to try, custom-built props to play with, secrets to discover and yes, shiny collectibles to hunt out and we’ve even included a never-before-seen NPC to chatter with, but it’s only a small sample of the finished production—and visually it’s incomparable".